On the top of the V3 receiver you should be able to see the drilled, tapped, and plugged holes for base mounting if desired. The Remington V3 comes with Remchokes, one of the most popular screw-choking systems in the world, along with the Winchoke / standard Invector / Accu-choke. If you want performance consistent with the information printed on ammunition boxes and in reloading manuals, naturally you'll need to use barrels that are dimensionally close to the barrels that were used to produce the data in the first place. The standard SAAMI 12 gauge test barrel has a bore diameter of .725 inches + .005 in., 30 inches long. Larger than .730 inch barrels invariably means velocity loss. Oversized bores are potentially less reliable with cheap wads, or fiber wads as well. 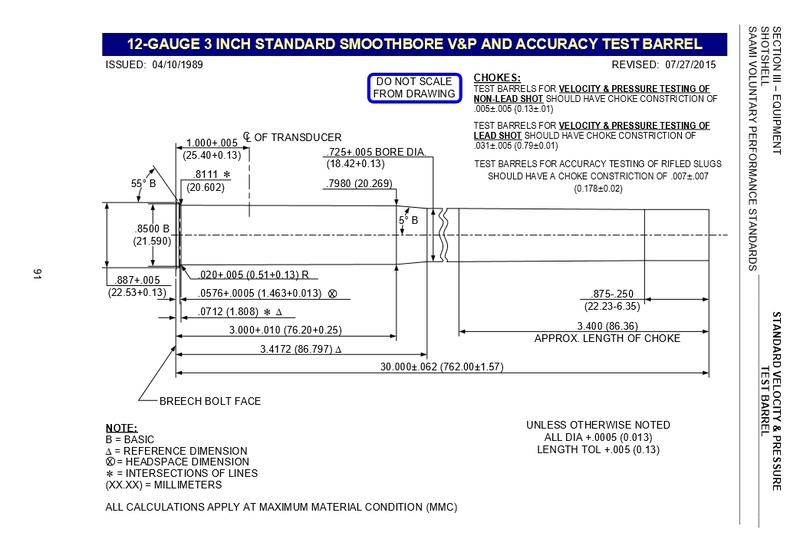 The production V3 barrel, measured by Skeets bore gauge, has a bore diameter of .727 inch. The three stainless steel choke tubes supplied have exit diameters as follows, also measured by Skeets bore gauge. As mentioned previously, all supplied chokes are steel shot approved, including the “Full” choke shown above. The supplied Remchoke choke wrench handles 12, 16, and 20 gauge Remchokes. Those that already have various Remchokes, factory or aftermarket, from their 1100s or 870s will be delighted that Remington did not take the "when all else fails, invent a choke tube thread" approach used by Beretta and others. Directly ahead of the trigger guard, you'll see the slide that is a magazine cutoff. This allows you to quickly get the shell out of the chamber when crossing a fence, or a quick load change without feeding a shell from the tubular magazine. It is well-designed and unobtrusive. The trigger guard crossbolt safety is reversible for left-handed shooters. As far as lubrication and maintenance, the V3 is a dream compared to many gas guns. I've certainly cleaned more "self-cleaning gas actions" than most. I don't bury shotguns in the back yard, leave them at the bottom of ponds, or stack them in sheds, so some of the sundry "wonder lubes" are of comparatively little interest to me. For most of my shotgunning life, I've managed quite well with Breakfree CLP, Hoppe's, and Super Lube. Oil is the best lubricant, as grease is merely a mixture of oil and soap: some type of thickening agent. It is fine for hinges and latches in O/U shotguns and static applications like choke tube threads, but higher-speed cycling parts need a light film of oil. On the V3, you'll want a light film of oil on the internal receiver rails. It will run dirty, but don't expect it to be at its best when dry. Other than that, the dual-piston array stays quite clean and eventually you'll want to scrub the pistons, and clean out the piston channels with Hoppe's and a .40 caliber brush, perhaps every 2000 rounds. For regular use, it is just clean the bore with Hoppe's and wipe the reciever with Breakfree CLP. It is a far cleaner action with less typical maintenance than the 302 / 303 / 390 series Berettas, the B-80 Browning, and the Remington 1100 for that matter. And, there is no magazine tube and mainspring in the V3 buttstock to crack, bend, or get filled with crud. Part Four is going to include a video overview with a few shooting and patterning examples.